As Bitcoin continues to gain traction more online casinos are accepting it as a way to play keno. Even though most people are hesitant to use this budding crypto currency, millions have already jumped onboard this monetary revolution. To date, over 22 million Bitcoin wallets have been downloaded worldwide. This translates to between 2.9 and 5.8 million active users who make a shocking 12,000 transactions per hour. Over 99,000 Bitcoins are sent every hour, and the top 100 richest Bitcoin holders are worth $19 billion. These impressive statistics have made this crypto currency too enticing for online casinos to ignore. Faced with a growing demographic of punters using crypto currencies, more casinos are starting to accept Bitcoin. Despite being completely unpredictable, the fast transactions and lack of bank fees has made crypto currency an enticing payment option for punters. From South Africa to the United States, Bitcoin’s popularity is holding steady. While the long term future of this mysterious currency remains to be seen, for now the temporary advantages have secured its place in online casinos. What started as a fringe investment has steadily evolved into a respected payment method. Out of all the ways to use Bitcoin, none are more advantageous than online keno. This rebellious crypto currency gives punters a welcome escape from the watchful eyes of banks and international governments. On top of providing quick payouts, it allows players to access sites that normally wouldn’t accept their traditional payment methods. To highlight the versatility of this new currency, we compiled a list of the best casinos that accept Bitcoin. Each entry boasts a robust list of keno options, so feel free to indulge in their wide selection of games! Dive into their clean layout and generous bonuses! Bitcoin Casino #3: FortuneJack Casino – When it comes to crypto currency casinos, there’s no arguing that this site pioneered the industry. In 2013, FortuneJack Casino was created by a group of gambling professionals. Each of the founders had over 20 years of experience in brick and mortar casinos, and this expertise is reflected throughout the site. The slick web design is only outdone by the sheer number of games available. Users get access to over 500 variations of dice, keno, pokies, blackjack, roulette, bingo and jackpot games. They also offer sports betting and live dealer games, which makes it a complete casino experience. What truly makes this casino stand out is their dedication to crypto currencies and customer service. In total 8 types of crypto currencies are accepted, including Bitcoin, Ethereum and Monero. All this is complimented by responsive live chat, email and customer support. They offer a welcome bonus of 110% up to 1.5BTC plus 150 free spins, so there’s no reason not to join! Get in the game with this upbeat site! 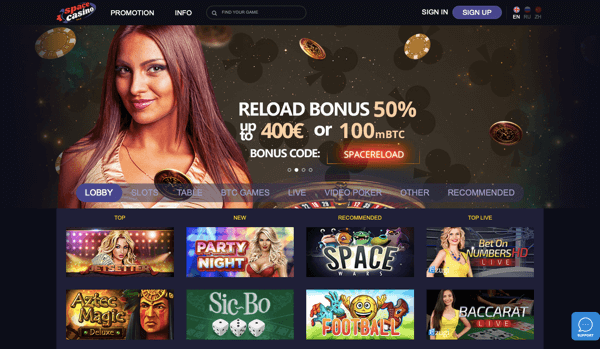 Bitcoin Casino #2: Space Casino – Even though this casino is a newcomer, it has won over punters from around the world with their impressive selection. When it launched in 2017, Space Casino made a name for themselves by partnering with all the top software providers. Releases from NetEnt, BetSoft, Amatic and SoftSwiss are featured in their staggering catalogue of 2,500 games. From keno to live dealers, no casino game is neglected on their roster. 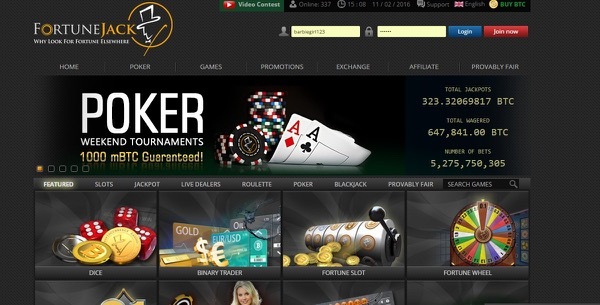 They also provide an enticing welcome bonus of 100% match up to 1BTC plus 150 free spins. Hesitant users can test out the site by using the 20 free spin promo code BOOK20FS, so try out this epic casino! Prepare to be blown away by their selection of games and payment options! Bitcoin Casino #1: 1xSlots Casino – When it comes to games and payment options, the sky is the limit with this bold casino. On top of accepting 17 different crypto currencies, 1xSlots Casino features 3,231 total games. This staggering selection is powered by 34 different software providers including punter favorites NetEnt and Amatic. It would take 8 years, 10 months and 6 days to play every game available. They haven’t neglected keno, so sign up to claim your 100% up to 300 EUR welcome bonus!